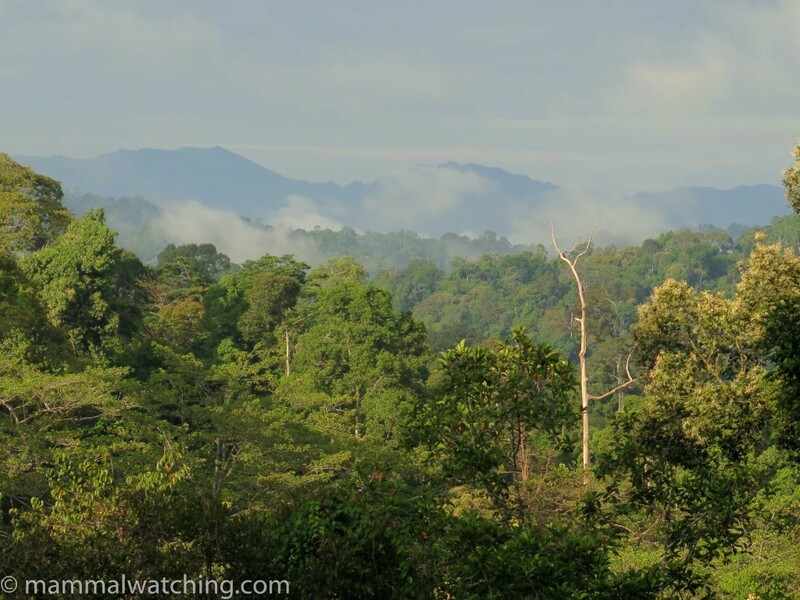 I had visited Borneo twice already but at the end of 2014, Jason Woolgar’s report of a visit to Deramakot Forest Reserve in Sabah arrived in my in-box. 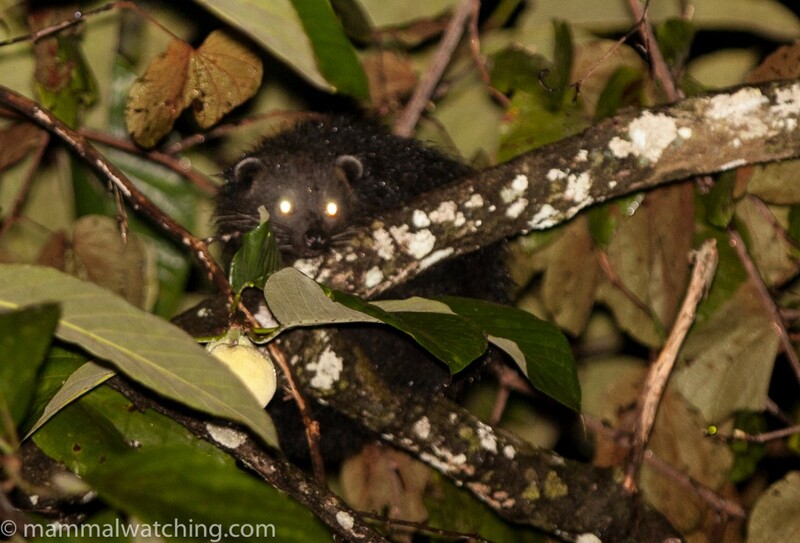 Jason saw Sun Bears, Banded Palm Civets and a Marbled Cat in just a few days. I could resist the call of South East Asia no longer and decided to return for a visit to both Deramakot and Sumatra. A week later Tomer Ben-Yehuda and Jean-Michel Bompar had signed up for a trip in May 2015. We chose late May because it was a period when the weather ought to be OK and Hari, the legendary Way Kambas guide in Sumatra, would also be available to guide us. It took 22 hours to fly from Newark to Kota Kinabalu via Hong Kong and 12 time zones. And so I was a little woozy when I met Tomer and Tom Hewitt – the owner of Adventure Alternative Borneo – at KK airport. We’d booked the Deramakot leg of the trip through Tom because he seems, for the moment at least, to be the only operator running trips into the park. It worked out well: he was easy to deal with, laid back and gave us a very reasonable price. He also assigned us Michael Gordon, an expat Scot, as our guide together with Lang, who would be our driver. 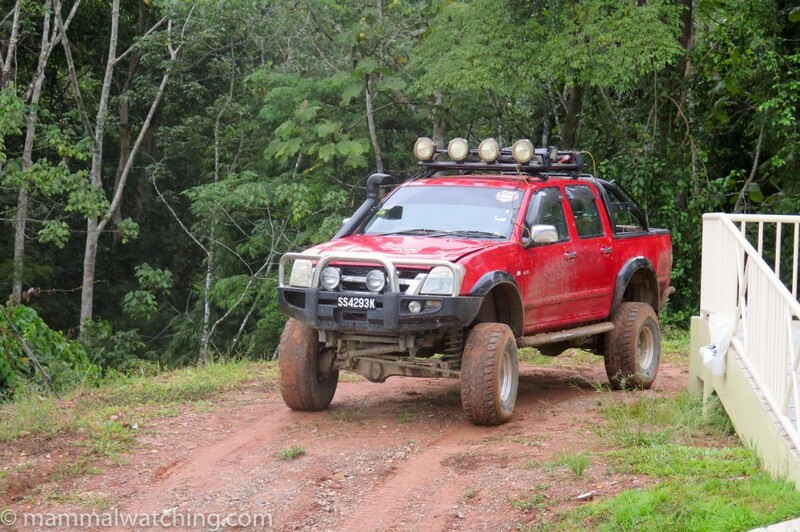 Lang owns an impressive 4wd. His truck might not have been the most comfortable vehicle I’ve travelled in (especially for five of us) but it was extremely useful for navigating some of the Deramakot mud and was well set up for spotlighting. 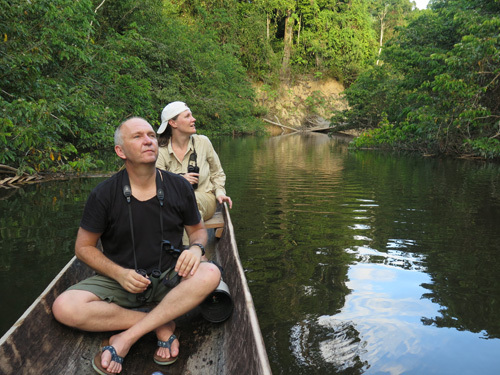 Michael will readily explain he is more of a jungle/adventure guide than a naturalist but he is learning – and keen to learn more – about the local fauna and flora. More importantly he was a truly excellent spotter, picking up a ton of stuff with the spotlight and apparently never losing concentration. He was still finding eyeshine even after three hours of sitting on the roof spotlighting in torrential rain. Lang too was happy – or seemingly happy – to follow our insomniac itinerary. I’d recommend asking specifically for these two if you visit. The drive to Deramakot from KK took seven hours, the final two of which were along dirt roads through plantation and into the forest reserve. 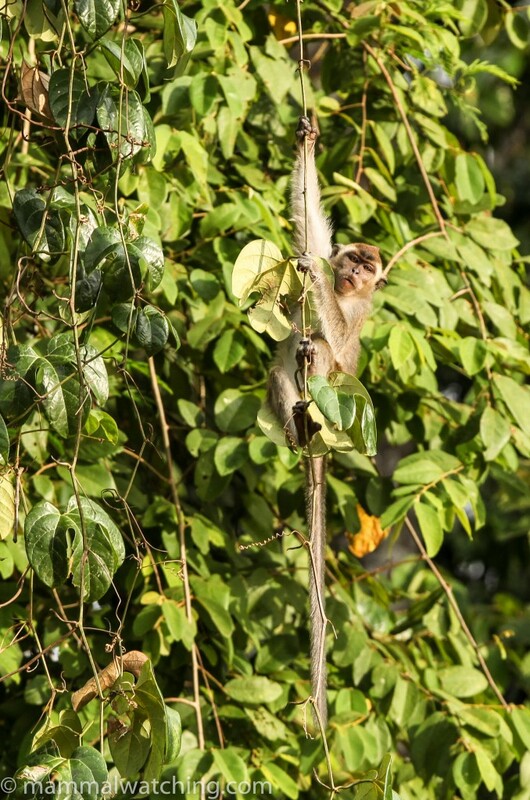 Jean-Michel had arrived in Borneo a couple of days before Tomer and me, and he’d headed to the Kinabatangan River (where he saw a Tarsier among other things). So we picked him up at Telupid Village to save him backtracking all the way to KK. 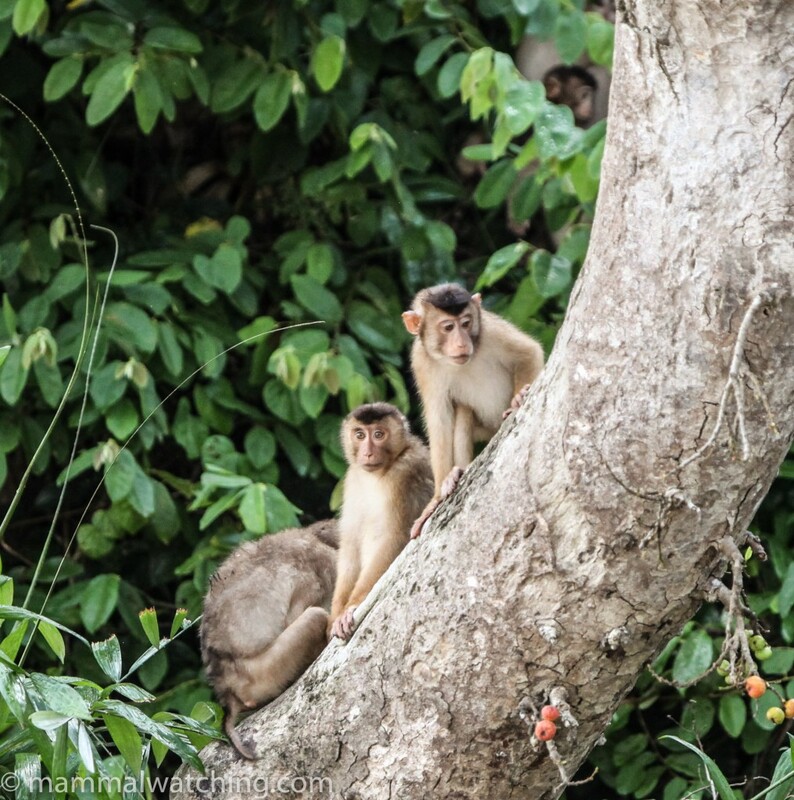 The only mammals along the highway were a few Long-tailed Macaques but, thirty minutes after joining the dirt road – at about 5 p.m. – we saw the first of two herds of Elephants. We were off to a flying start. The Deramakot accommodation is a great base for a field trip. The forestry HQ there is much bigger than I was expecting: more like a military base than the sort of small forest HQs I’m used to in Thailand for example. We were staying in a new house at the edge of the camp. We hadthree bedrooms, AC and hot water: more luxury than I was expecting. 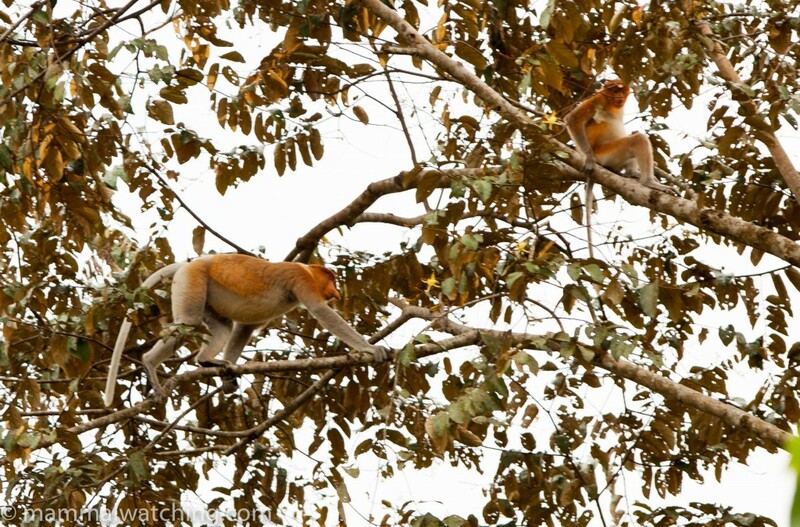 The reserve itself is traversed by one well-maintained road that runs 32 km from the accommodation to the upper Kinabatangan River. There are a network of other smaller roads, largely cut for logging trucks, that were not well maintained. We only ventured along a couple of these and got bogged on one of them. However I didn’t see much point in leaving the main road, which is quiet, while its width makes for a better field of vision than the narrower side roads. 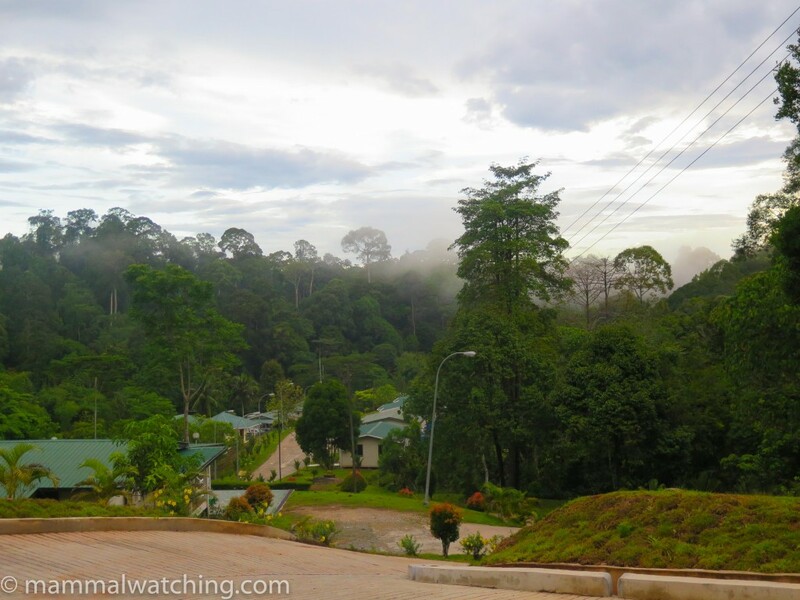 Deramakot appears to be the jewel in the Sabah forestry department’s crown, and they proudly describe the sustainable and selective logging management that they operate here. Judging by the amount of wildlife we saw it seems to be working, and Jason’s report explains more about their management practices. We arrived close to 9 p.m. and Michael cooked up some noodles. Despite the long day’s drive, he and Lang were ready to take us out spotlighting that evening. I was reluctant even to ask them but Tomer had no such hesitation. Our first night drive was fabulous. One of the best I’ve ever taken outside of Africa. In two hours or so we had Common and Small-toothed Palm Civets, a distant Binturong (which I refused to believe was a Binturong until examining Tomer’s 100x zoom picture), several Thomas’s Flying Squirrels, a Leopard Cat walking on the road, a Bornean Slow Loris, and then, best of all for me, my first Banded Palm Civet. 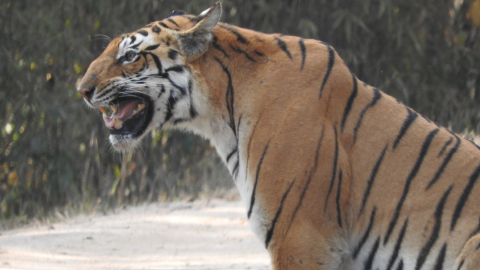 We had a short but very clear and close look at the animal as it walked in front of the car. A really lovely looking beast. 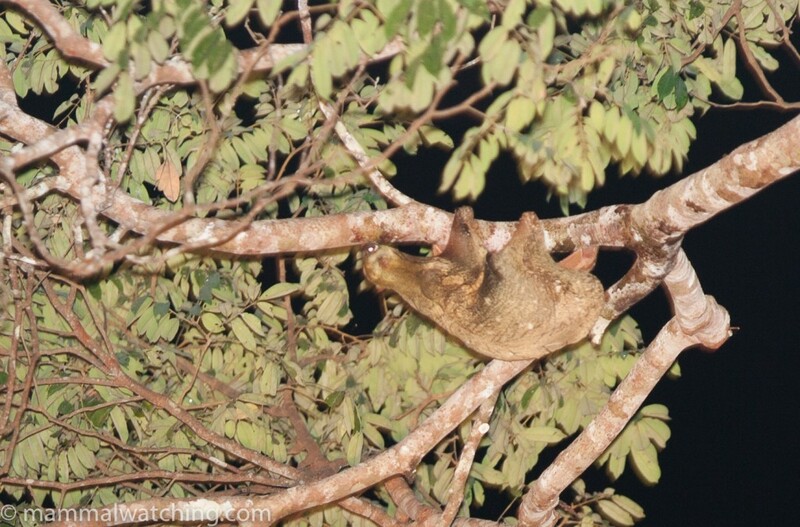 Heading home we stopped to look at yet another Thomas’s Flying Squirrel and a Colugo glided straight over our heads. 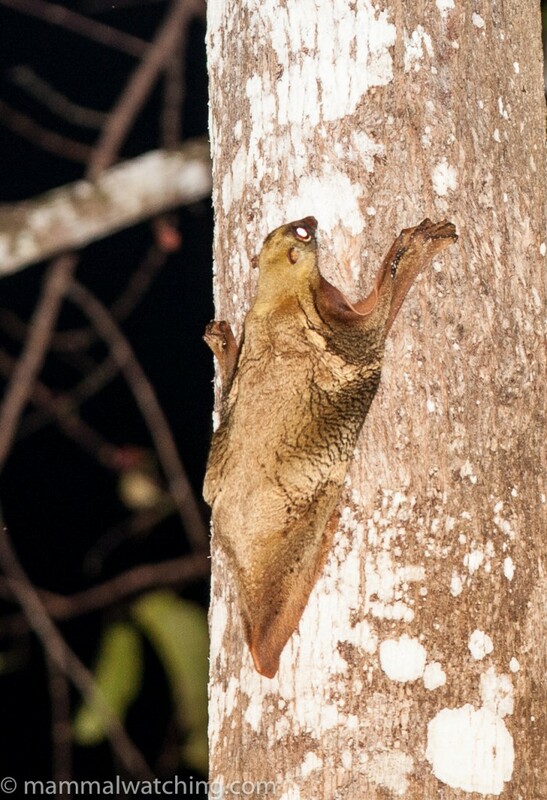 The landing Colugo flushed a smaller flying squirrel, though I have no idea which species, which flew to another tree. 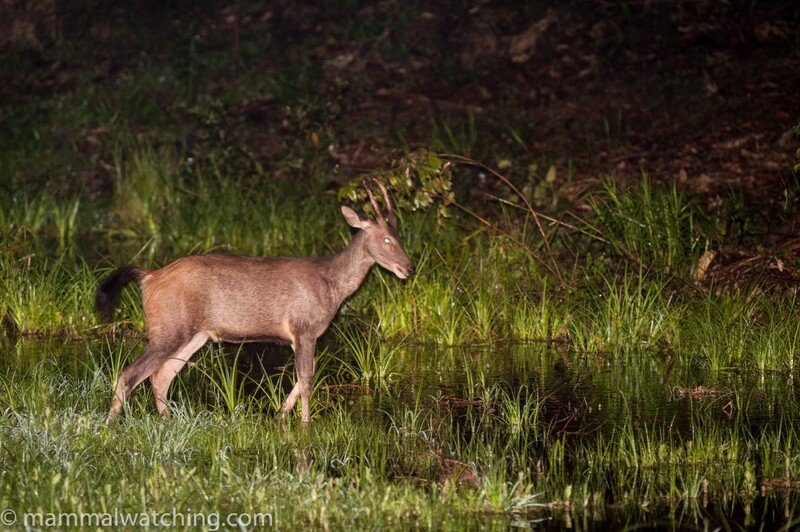 Back near the HQ we saw several Sambar. All in a couple of hours. Great night. 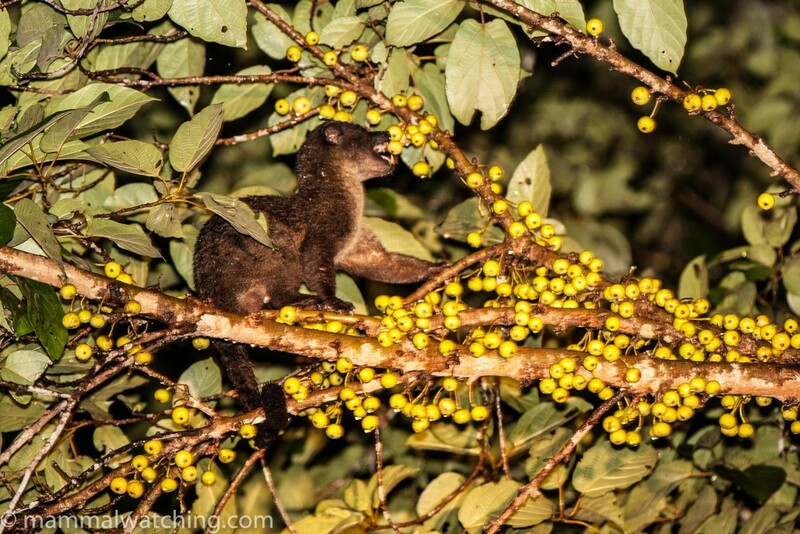 Every mammal watcher knows that each forest has its own unique bugosphere of annoying things that bite, sting and generally get in the way of a happy night’s spotlighting. If there aren’t ticks, there must be leeches. If there aren’t mosquitoes then there are army ants. Most forests house at least one of these pests in biblical proportions. 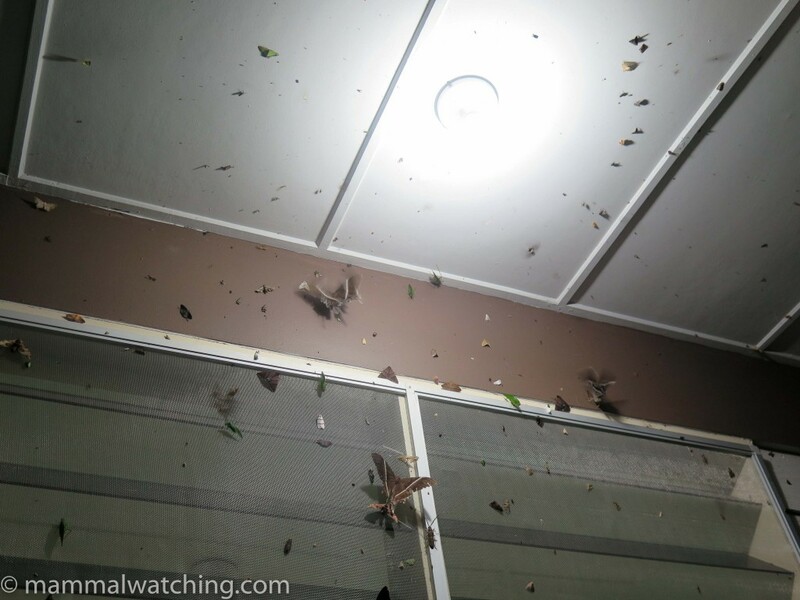 In Deramakot the leeches and mosquitoes have made way for a battalion of enormous flying bugs, many of which sting like psychopathic wasps on steroids. This makes spotlighting something of a challenge. Especially if, like Tomer, you don’t get on well with insects. The soundtrack to our evening was a succession of screams and yelps, coupled with violent leaping and hand flapping, as Tomer battled to keep one hand on the spotlight and one foot inside the truck. If James Brown had been watching he’d have gotten some inspiration for his next routine. The small spot behind the ear was a barely visible but constant feature in every picture. 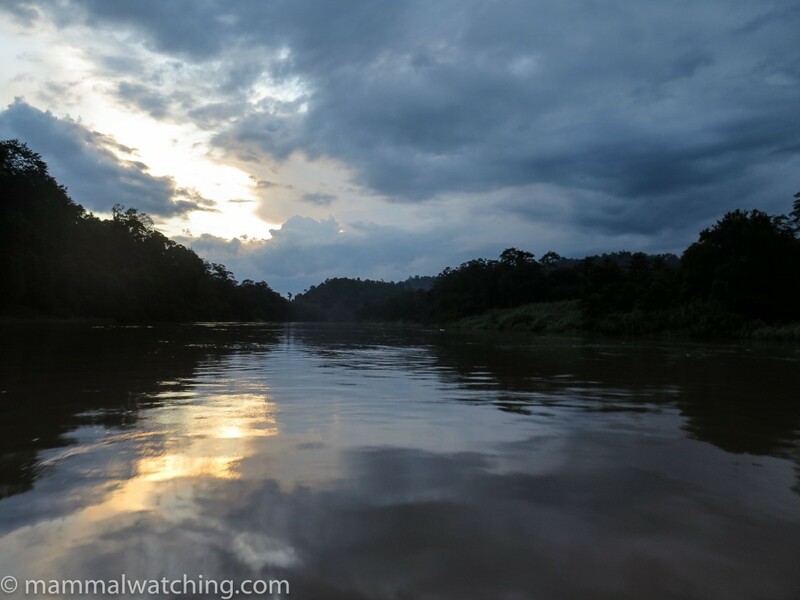 After a few hours’ rest and lunch we drove the 32 km to the Kinabatangan River, arriving in the late afternoon for a two hour cruise on the reserve’s boat. The light was fading fast as a thunder storm approached, and we didn’t get very far along the river, stopping to take pictures of Long and Pig tailed Macaques and Proboscis Monkeys (not always spotted this far up the river according to Michael). We ate by the river and then set out for the long spotlight home at around 8 p.m. The first hour of the night drive was spectacular. 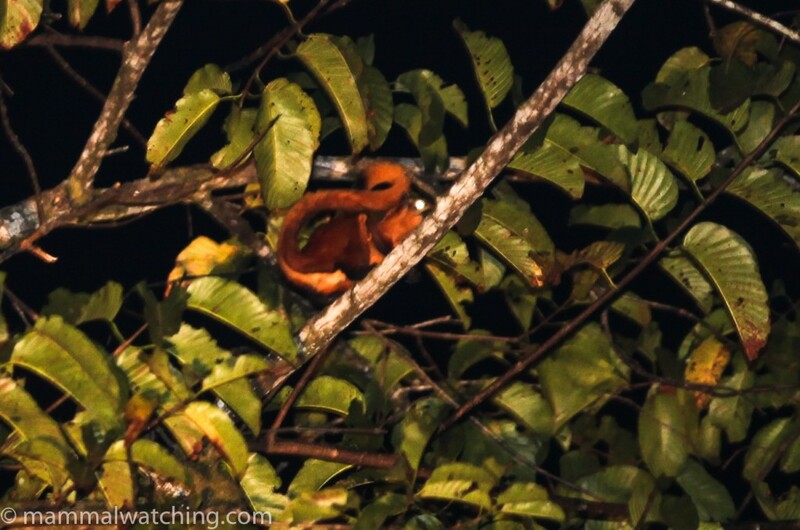 We had nine species with many Thomas’s and a few Red Giant Flying Squirrels (the easiest way to separate these species is to check the tip of the tail, which is red on Thomas’s and black on the Red Giant). 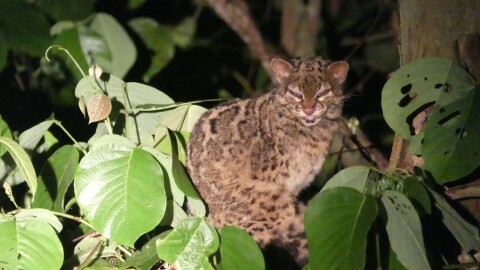 We also saw a Slow Loris, a great – but hard to photograph – view of a Yellow-throated Marten, a Malay Civet, a Common Palm Civet and then a Leopard Cat. In an hour! We also saw the back half of something rather small and grey with a short rounded tail move off of the road. Both Jean-Michel and I thought it was too short-legged to be a cat and the tail and colour suggested Otter Civet, but Michael – who had had a better view than us – seemed sure it was a cat. 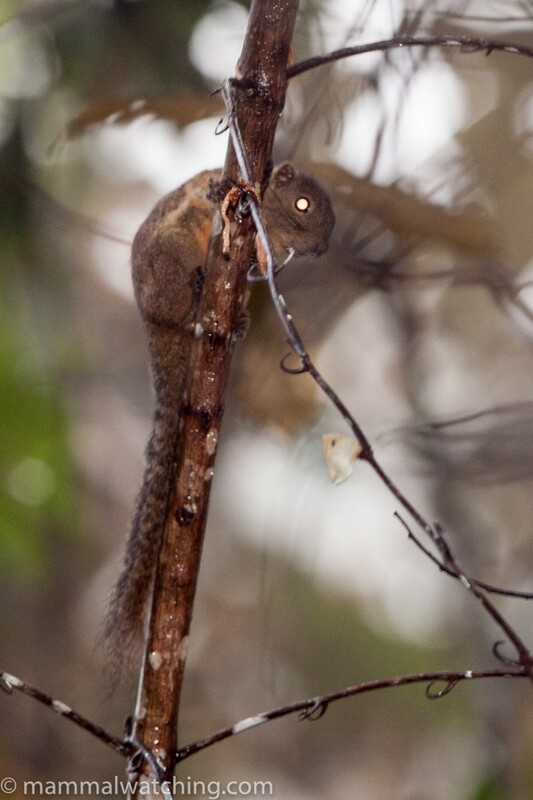 Thomas’ Flying Squirrel, Aeromys thomasi, with a red tip to its tail. But at 9 p.m. the heavens opened and that was pretty much the end of mammal watching for the next 25 kms. Not that Michael stopped trying: he insisted on sitting on the roof in the stinging rain, but not surprisingly saw very little save for a flying squirrel and some Sambar back near the house. 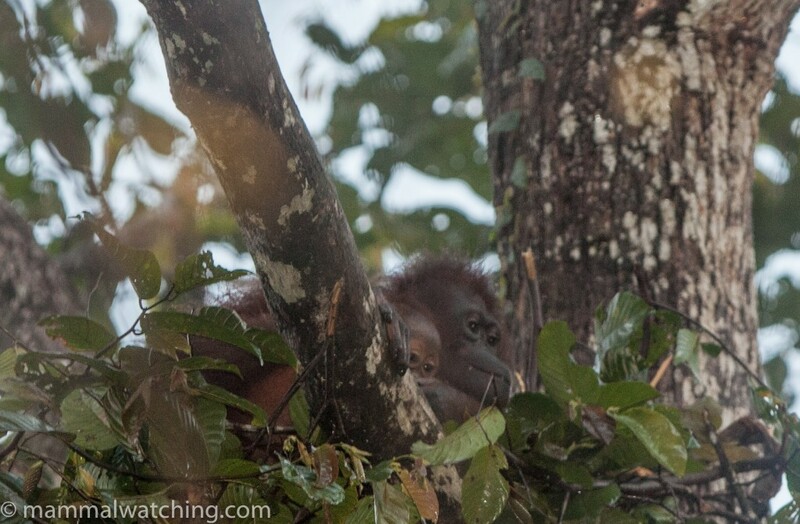 We started at dawn and found an Orangutan mother and baby next to the main road. Orangutan nests are everywhere throughout the reserve. 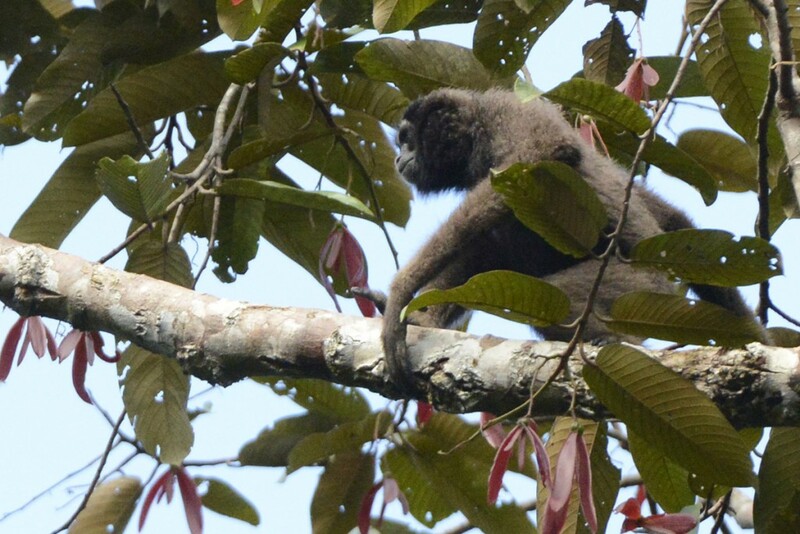 The other highlights of the morning were two separate troops of Bornean Gibbons. We also saw another squirrel. 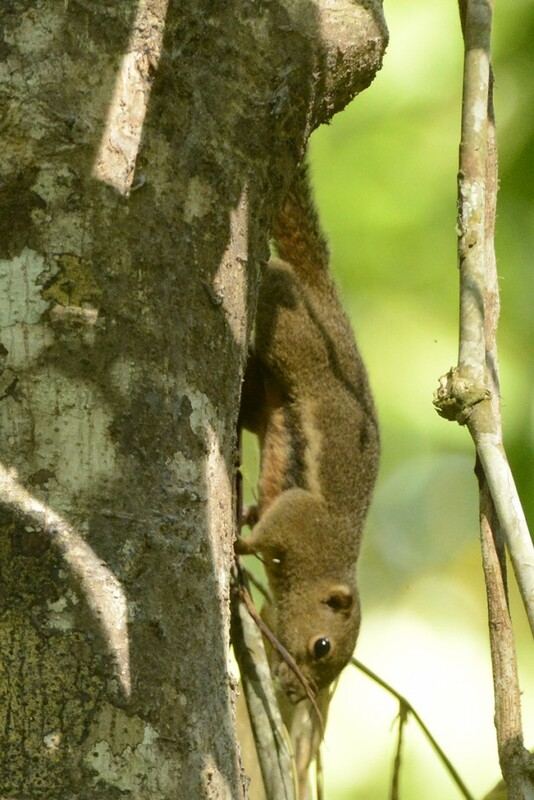 I think it must have been a Low’s Squirrel though its hard to be sure and for a while we thought it was a Slender Squirrel though according to the Phillipps field guide they do not occur in Sabah. There were more Prevost’s Squirrels too. 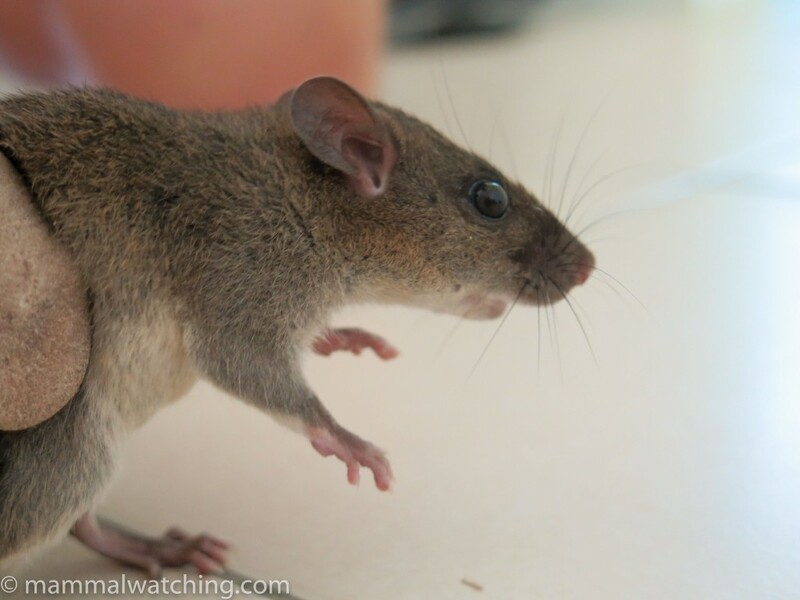 Back at the house we caught a Ricefield Rat (Rattus argentiventer), a lifer for me. The weather was looking good for the night, so we talked to Michael and Lang about the possibility of taking a very long night drive. They were ready participants, especially after we promised that, if we stayed out till 3 a.m., they could take the following morning off. The conditions were pretty much perfect: no wind, no rain, no moon. And even though it felt like it was a few degrees cooler than the night before, the temperature must still have been in the mid 20s. But the going was much slower than the previous two nights. Interestingly there seemed to be far fewer insects flying around, which was something of a relief for Tomer. There seemed to be fewer bats too, perhaps as a result. But although the sightings didn’t come as thick and fast as they’d done the previous two evenings, we still found 11 species, which is pretty incredible for a night drive in this part of the world or anywhere come to that. We had several Common and Small-toothed Palm Civets, a Malay Civet. 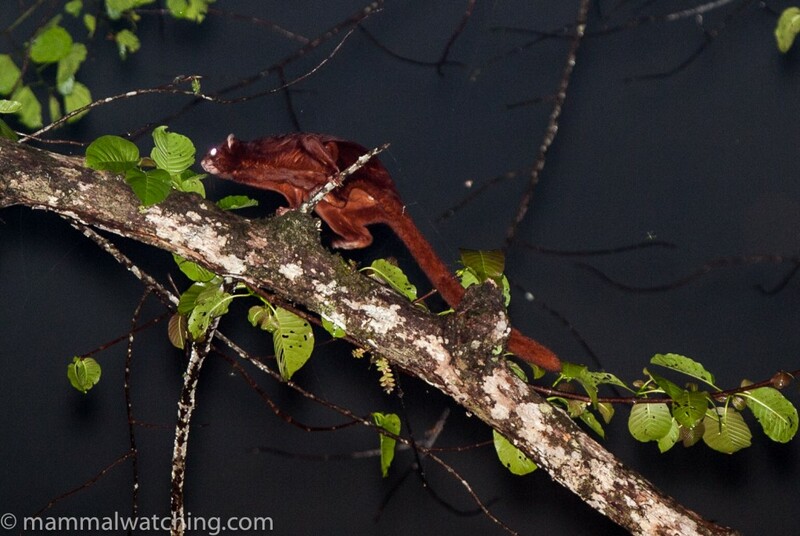 and great views of three Colugos. 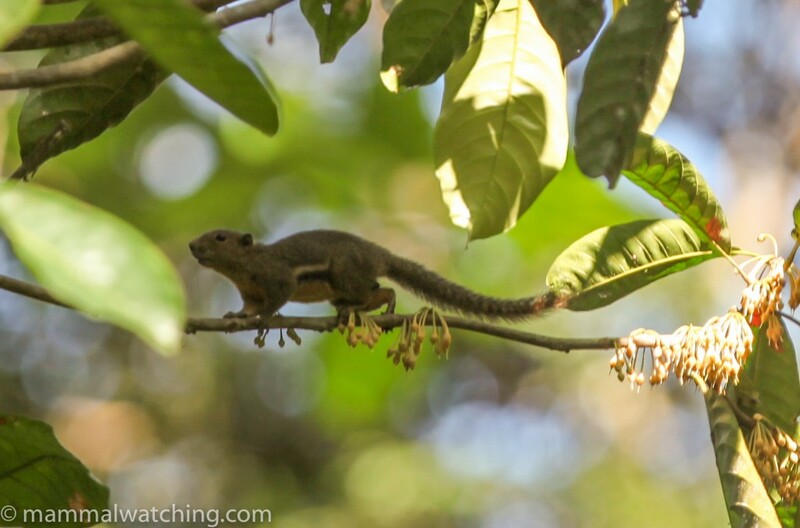 We also saw another Binturong, this time out in the open for a few seconds, as well as multiple Thomas’s and Red Giant Flying Squirrels and our first Black Flying Squirrels of the trip. None of us saw properly a small cat on the road but Lang, behind the wheel, got the best view and seemed pretty confident it was a Flat-headed Cat. We saw what was probably a Leopard Cat shortly after. As well as driving for well over five hours, we spent a couple of hours on foot, primarily looking for Tarsiers which we didn’t find though Michael had spotted them in the area before. 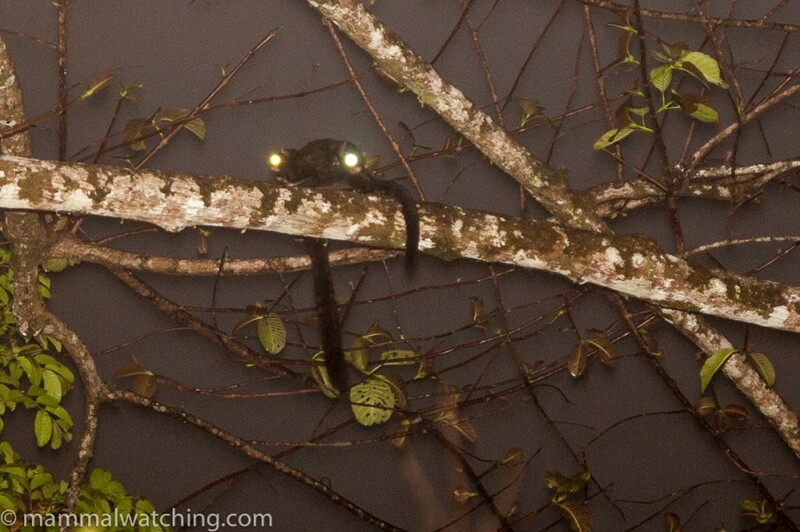 Tarsiers seem to spend most of the night within two metres of the ground so we were focussing on that sort of height and Michael spotted a pretty Grey Tree Rat, my third lifer of the trip, that was unfazed by the torch beams. Perhaps because of the light it looks much browner in the picture below than it did in the picture above (and in reality). We were home by 4 a.m. after an epic eight hour night drive. The significant difference in sightings per hour between this and the previous two nights led to much speculation about the reasons, none of which seemed all that convincing. But I’m beginning to doubt whether the moon really does have much of an effect, at least compared to other mysterious factors. Had this happened with a full moon we’d have blamed the lower mammal count on that. 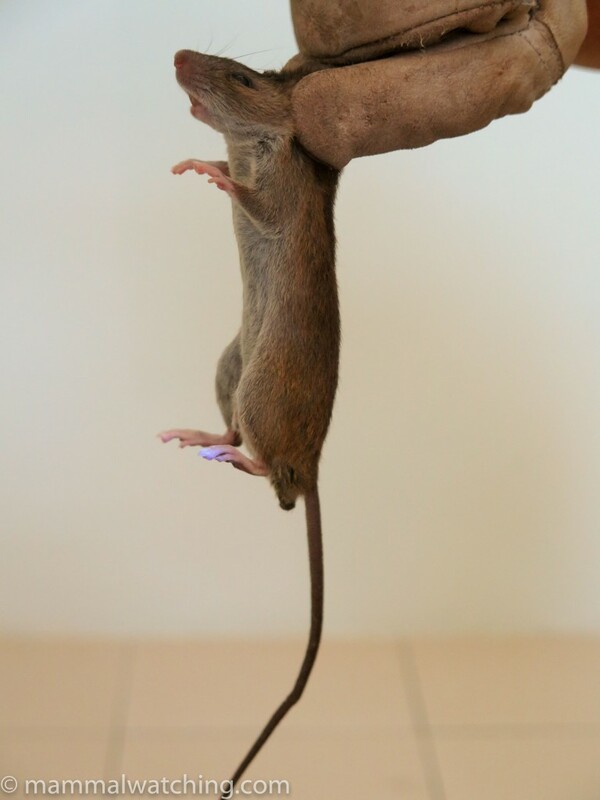 We caught a Malaysian Wood Rat (Rattus tiomanicus) back at the house but otherwise did very little all morning. We had a lazy afternoon too. 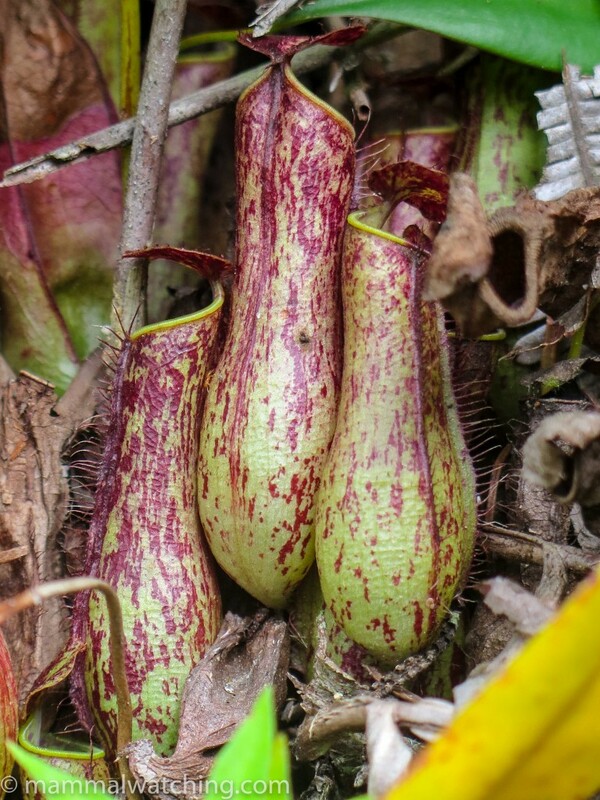 Tomer and Jean-Michel spent time on the back porch, staring into the edge of the forest where they spotted a Long-footed Tree Shrew and a Plain Pygmy Squirrel. 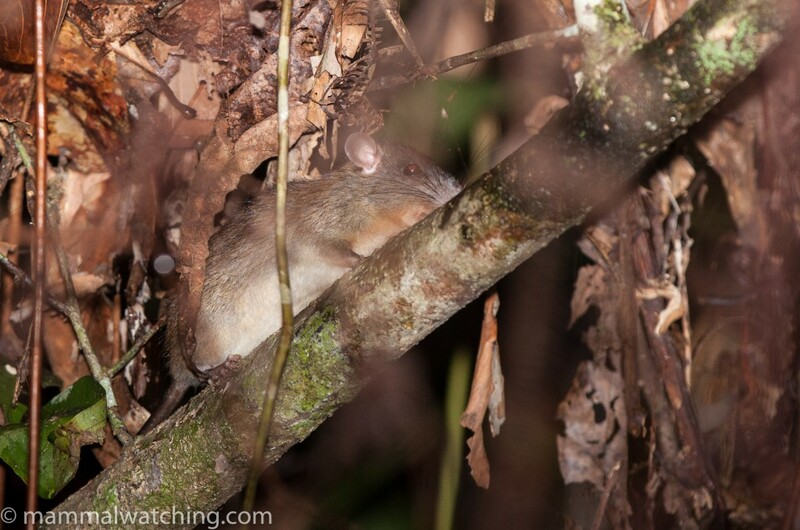 An effective way to see treeshrews seems to be to find a thicket of vines and wait. We took a shorter (four hour) drive for our last evening. We began by driving back up the road that runs out of Deramakot, via the local rubbish dump. The rubbish dump was mammalless, with all the trash buried deeply, but the road out of the park was pretty good for spotlighting. 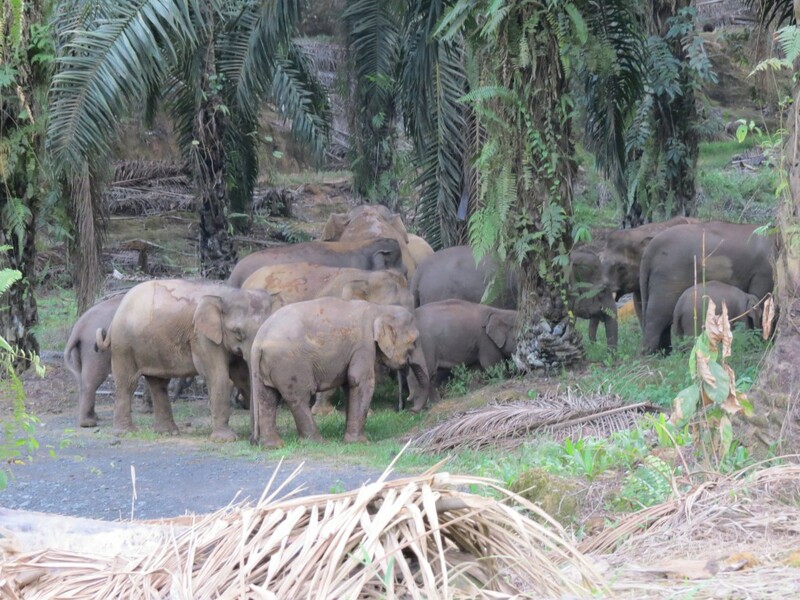 Despite intermittent heavy rain we had 11 species again, with more Common and Short-toothed Palm Civets, a pair of Binturongs (with another lone animal later on making it five in four days), another Banded Palm Civet, a Malay Civet, a Leopard Cat, a Slow Loris, more Sambar and my 5th lifer – and 1400th mammal – some Spotted-Winged Fruit Bats feeding on figs. These were only identified after the intrepid Jean-Michel managed to photograph them. 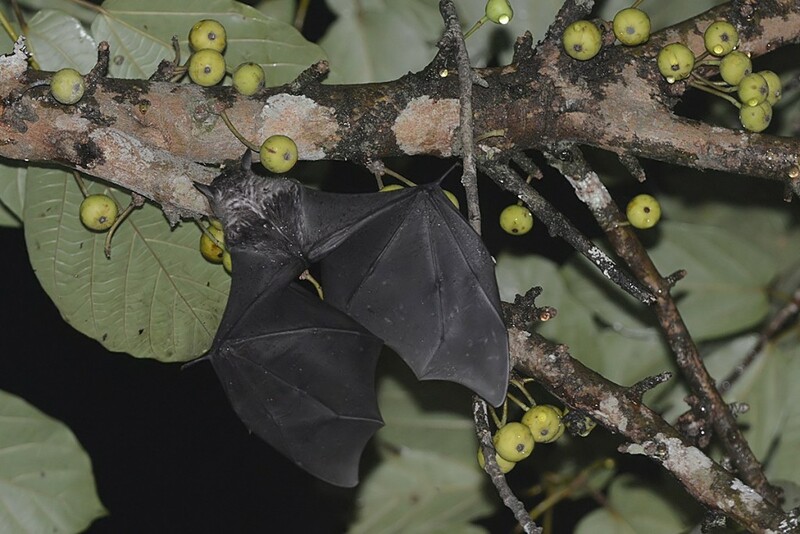 No mean feat in the heavy rain, with the bats typically landing on the tree for less than a second to grab a fig. 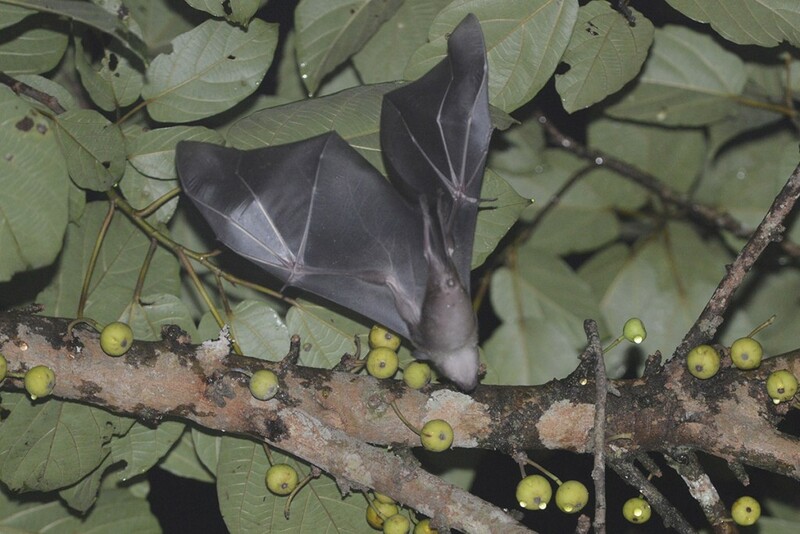 Spotted-winged Fruit Bat, Balionycteris maculata. Photo by Jean-Michel Bompar. At first we thought the spots on the wings were rain drops. 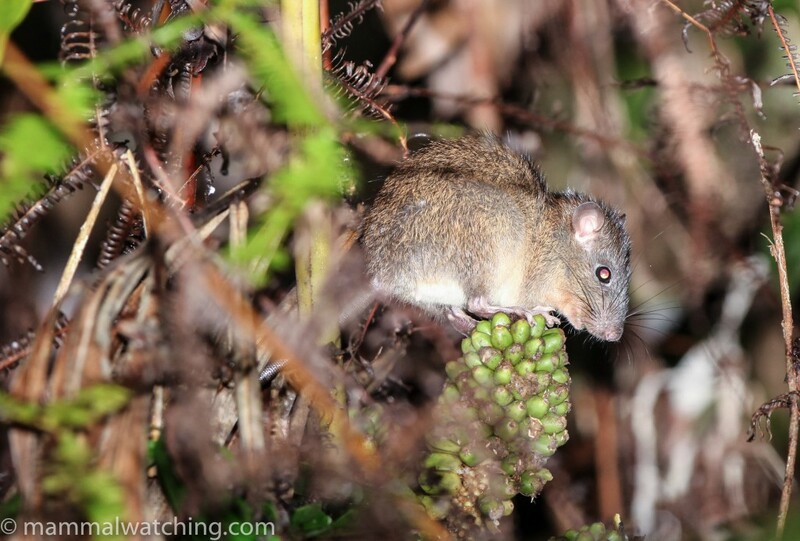 Tomer and I staked out the forest behind the house for an hour at dawn and saw both Long-footed and what I think must have been Slender Tree Shrew. 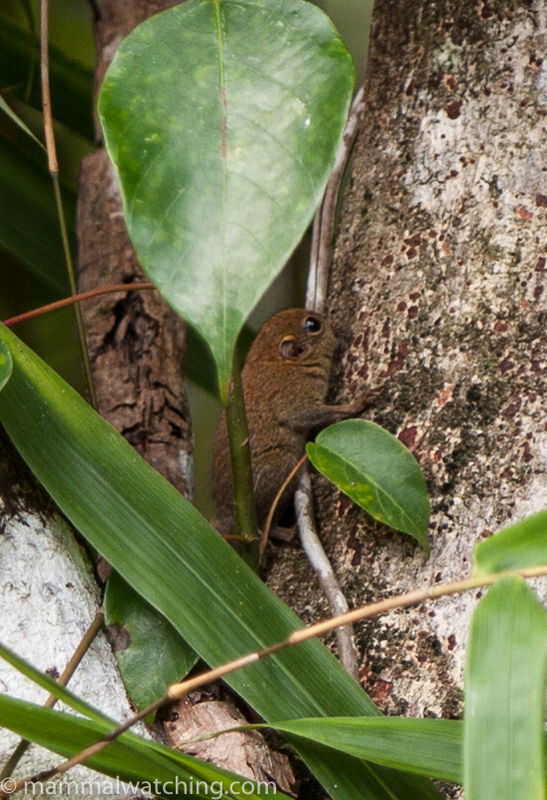 It seemed considerably bigger than the Lesser Treeshrews we would go on to see at Way Kambas and lacked any rufous on the belly. 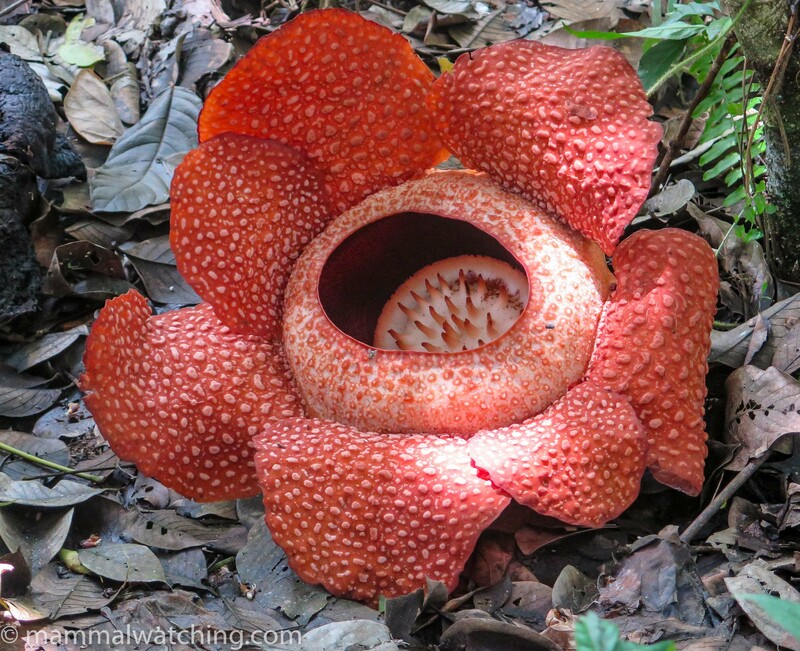 By 7.15 a.m. we were on the road, arriving back to KK – via some Rafflesias and Pitcher Plants at Poring Hot Springs – in good time for out 17:10 Air Asia flight to Jakarta. Way Kambas awaited us. I was hoping we’d find at least one mega-mammal at Deramakot. 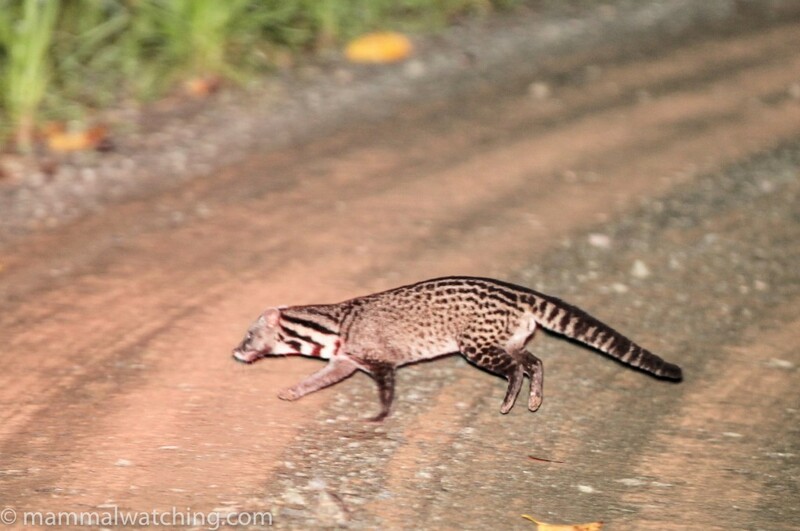 We didn’t, though we did see a lot of species including several that are not easy to see, such as Banded Palm Civet. There is no doubt that Deramakot has huge potential. The density of mammals suggests that this place ought to be as good as anywhere for Clouded Leopard, Marbled Cat and Sun Bear. If you combine that animal density with the solitude of the park and freedom to spotlight then it ought, in my opinion, be near the top of the “Where to find a Clouded Leopard?” list. Having said that, Clouded Leopards are not spotted often so far as I could work out, nor are Sun Bears. 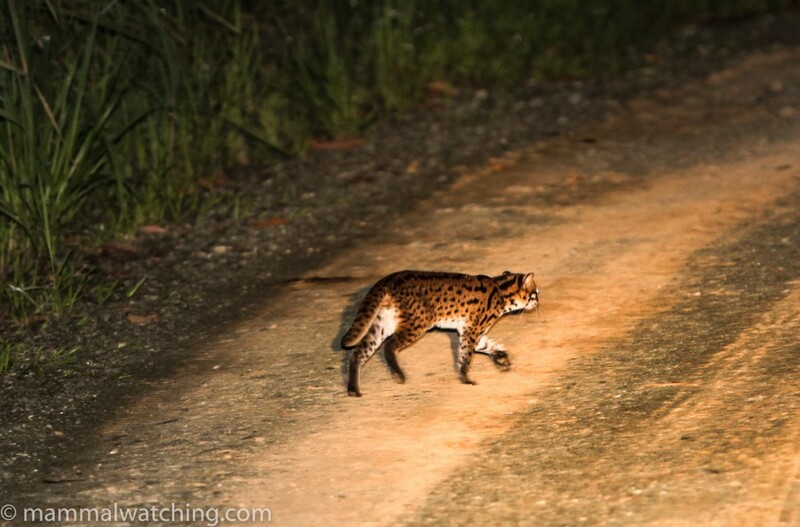 And perhaps Jason Woolgar was extremely lucky to see both Sun Bear and Marbled Cat in a few nights. Bay Cat is reported occasionally though there is scope to misidentify that species so I am always cautious about records. 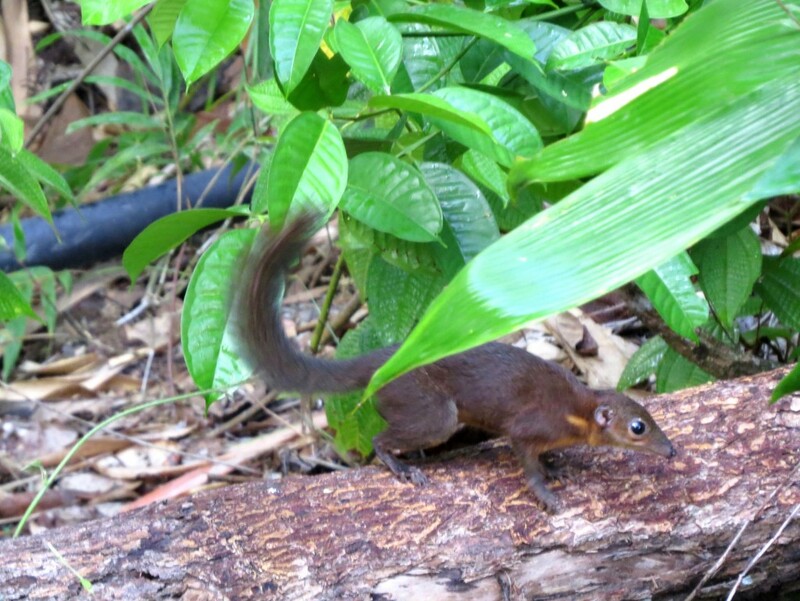 Pangolins are still present too with an outside chance for the fabulous Tufted Ground Squirrel (a camera trap photo of it is in the office), and Tarsiers ought to be findable with some luck. As more mammal watchers visit we will hopefully develop more intel about how best to see some of those species in the park. I hope to return before too long. A big big thanks from Jean-Michel, Tomer and me to Michael Gordon, for his talented and tireless spotlighting, and to the indomitable Lang for driving so long and so late. 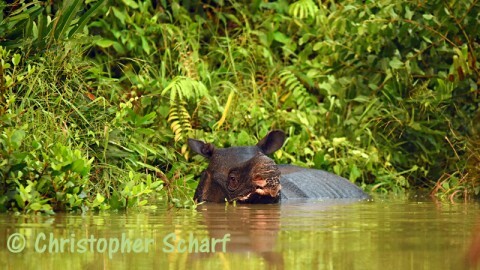 Part 2 of the Sabah and Sumatra trip report, covering Sumatra, is here.